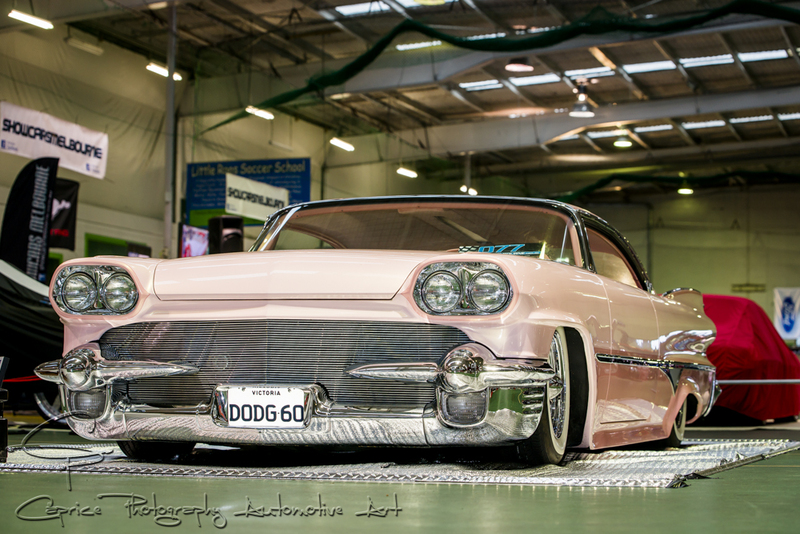 Arriving early morning at Westgate Sports Centre, Elvis and his crew were preparing for ShowcarsMelbournes’ main day. Having had all the show cars brought in and set up inside the day before meant it was just a matter of preparing for the enthusiasts and their families with food marquees, trade stands and various entertainment aspects of the show. I headed inside to the cool ambiance of the indoor event and was greeted with the sight of every car enthusiast’s ideal showroom! Gleaming chrome and paint from highly detailed rides reflecting the fluoro lighting above while other rides exuded shapely details from under their car covers. I took the opportunity to capture the cars and bikes in the quiet spender that lay before me, undisturbed by the hustle and bustle that was to be anticipated in the hours ahead. 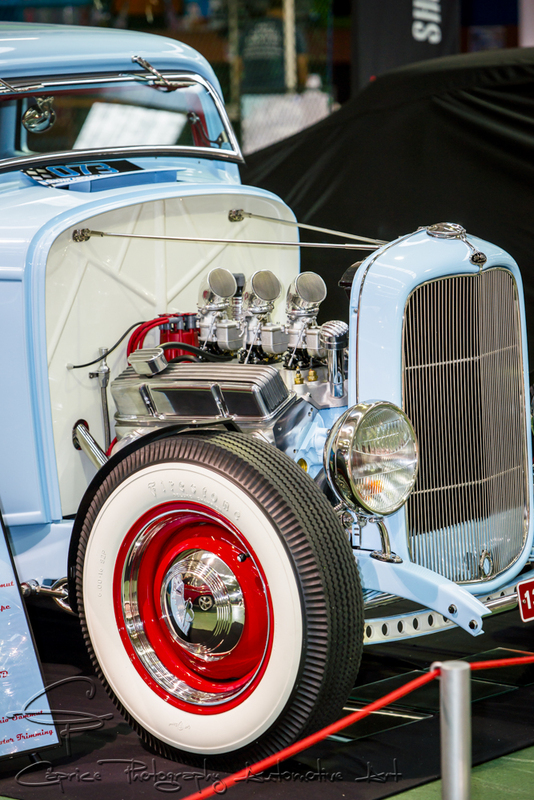 Owners of the show cars and bikes ambled in and touched up the final details of their prides and joy with a dust off here and wipe over there, opening up bonnets, boots and doors. Those with full displays turned on their lighting and made final adjustments in readiness for the viewing public and judging. Being the fourth event ShowcarsMelbourne has held here, this one was to be the first wet one with wintery blast outside expected for most of the day. In the past, the outside carpark fills quickly with many more great rides of all shapes, sizes and styles but we knew this time to expect the numbers to be down on previous years. 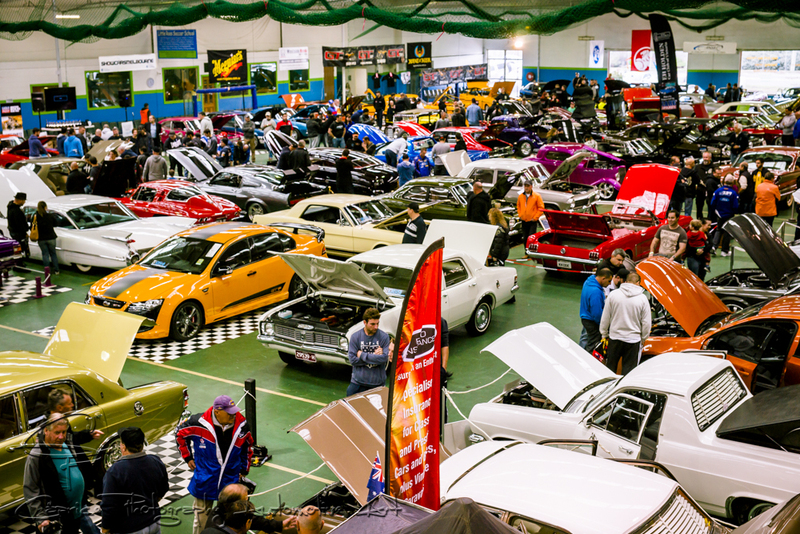 The number of cars may have been down but the weather certainly didn’t deter the enthusiasts and their families from coming down to the indoor spectacular which was great to see! The previous three years had definitely left an infallible mark on attendees and word had got around of what to expect from the event. Each year, Elvis sources a number of standout cars as a drawcard to the show. This year, the high quality custom and major trophy winner, TOXIC Q owned and built by Lou & Violetta Ackovski took pride of place in the complex while flanked by standout rides of Dabb’s sixties inspired 1930 model A Tudor titled Brown Sugar and Paul and Lisa Vanzella’s Zocchi customized salmon pink 1960 Dodge Pioneer. From there, it was row after row of classic, custom, muscle and late model rides from locally built marques as well as imported marques all vying for attention. 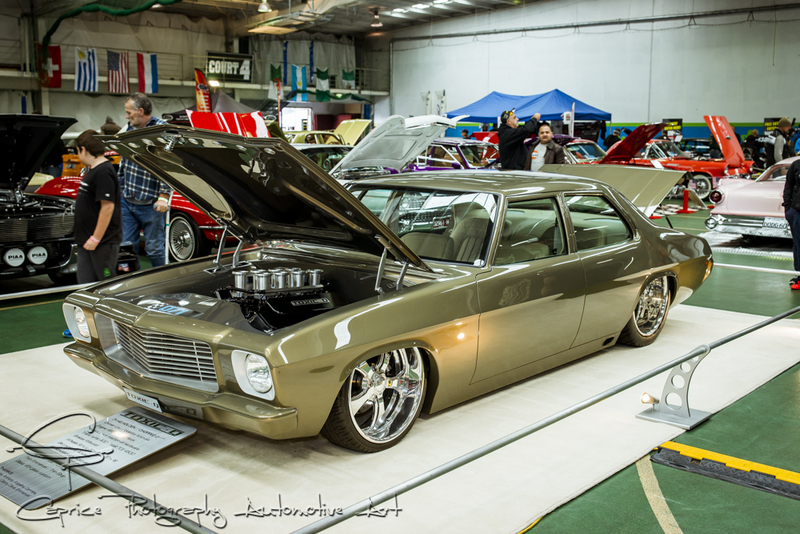 The rows of high quality show cars and bikes were flanked by major trade stands such as The GT Shop and Street Machine magazine which had an ANDRA top fuel rail parked in front that seemed to stretch from one and of the building to the other! Outside were more trade stands as well as food and coffee stands braving the elements. 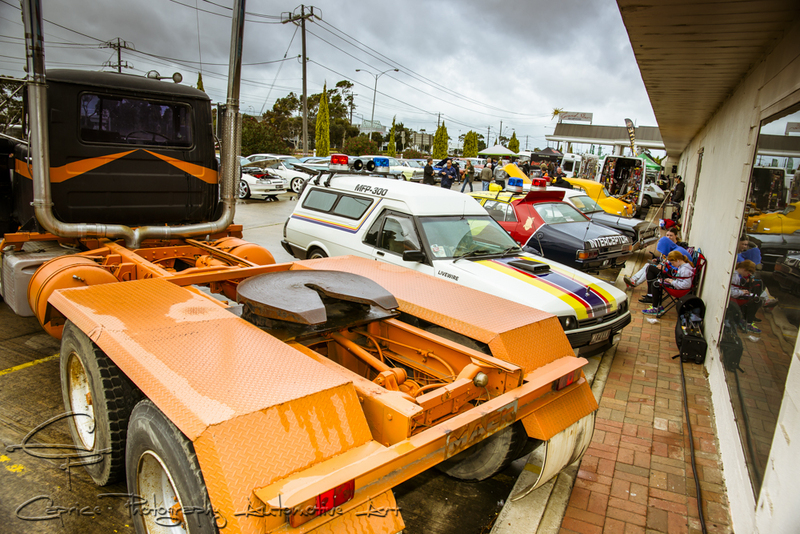 On display was also the Mad Max display including the renowned Mack truck and XA police car which had seen worse than this in their futuristic lifestyle. Mad Max wasn’t bothered by the elements as they’d seen worse! 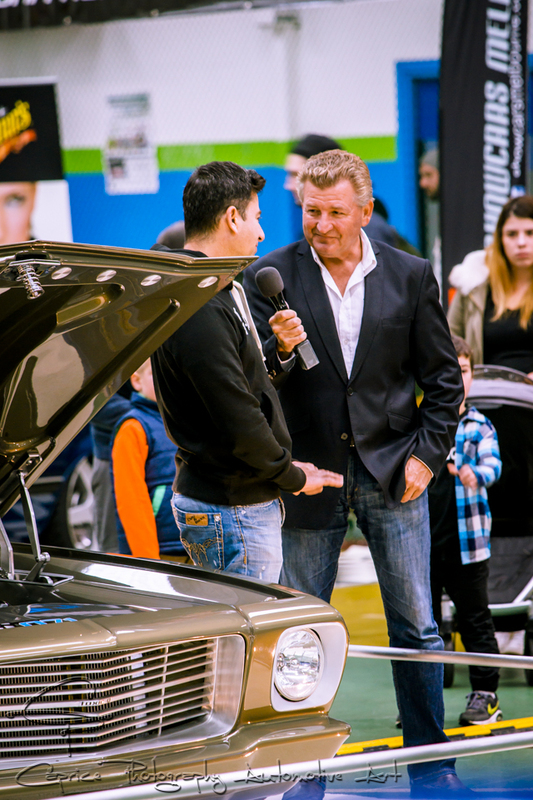 Fletch from Classic Restos came down to film an episode for his classic car tv show as well as contribute to the announcement of the trophy presentation with the announcement of the top ten awards. Check your local guides for further details or jump on his site to stay up to date. 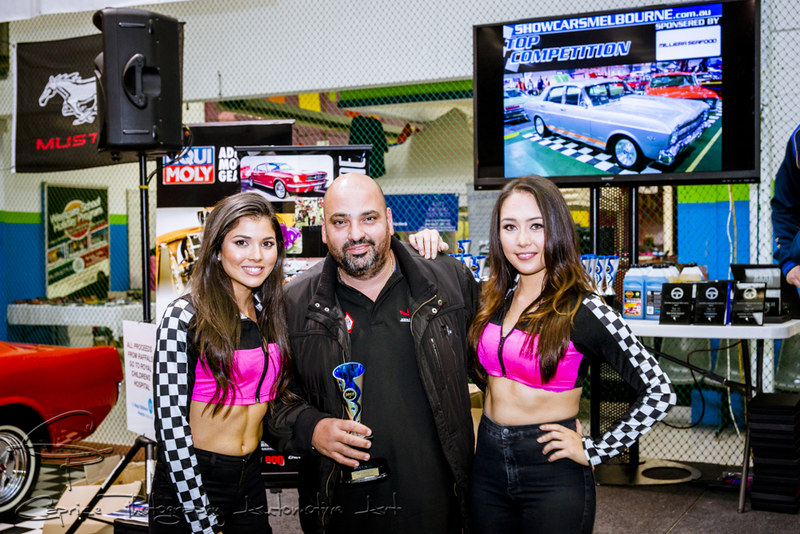 As the day wound on, it was time to draw the raffle and announce the trophy winners with the help of two beautiful promotional girls who patiently posed with each winner for a quick pic. 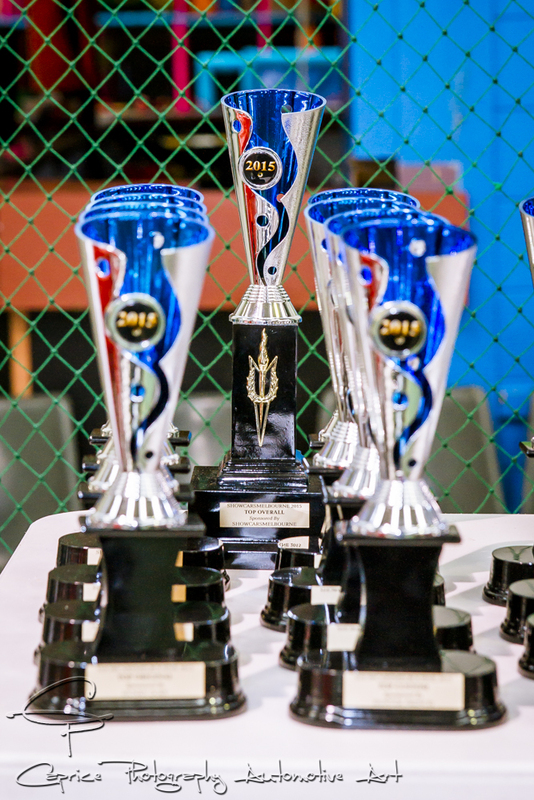 With announcements and congratulations past onto participants and organisers, it was time to wind up the proceedings for another year. Tough day for judges with so many high quality rides! A big well done must go to Elvis and the team of ShowcarsMelbourne who put on a flawless event each year and also to the dedicated car and bike owners who, despite the dirty weather, brought their rides to the show regardless spending many hours bringing them back up to the high quality standard they were built to. Elvis and his team run another event later in the year in Acland St, St. Kilda so if you’re looking for another great event with all the trimmings to check out, then jump on his web page or Facebook site and stay tuned. You won’t regret it! If you would like to stay up date with my site, just click FOLLOW on the left and you’ll receive weekly automotive emails! So much class in all that space! Fletch from Classic Restos interviewing Lisa and her 60 Dodge Pioneers kustom! Cheers Blairy! I appreciate the compliments and feedback! Luv ya ride too!